It's not a bird, nor a plane. But Uber's new prototype vehicle unveiled Tuesday shows off its vision of the future of transportation—a "flying taxi" that aims to alleviate urban congestion. 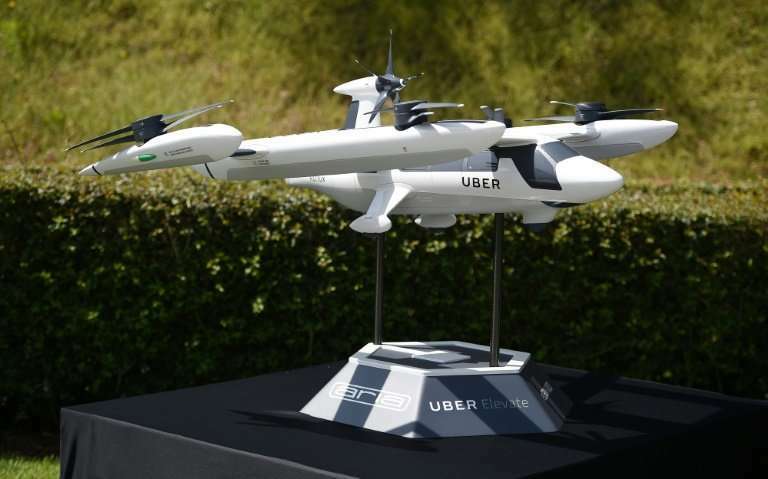 A model of Uber's electric vertical take-off and landing vehicle concept (eVTOL)—a cross between a helicopter and a drone—was displayed at the second annual Uber Elevate Summit in Los Angeles. "Our goal is to radically improve global mobility," said Uber Aviation product chief Nikhil Goel. "We fly a lot so we can prove to the FAA (Federal Aviation Administration) and the public that these aircraft are safe," he said. "The rational choice for transportation will be less and less to own and drive a car," Allison said. "We want to price it so low, it'll be irrational to drive your car." At the conference at the Skirball Center in Los Angeles, Uber showed films and models of a futuristic city with such vehicles, seemingly inspired by the film "Blade Runner." The concept includes "skyports" that would serve as hubs for the aerotaxis. Uber operations director Jeff Holen says the obstacles to the new transport mode are mostly around regulations of air space, adding, "The technology exists... we can solve this today." What happens when this thing hits a pedestrian?? UBER death machines falling out of the sky. If anyone is stupid enough to think the public will tolerate anywhere near the same number of collisions in the air as on the ground. See, this is how companies lose money. Uber must have money to burn. Flying cars are no closer to reality now than they were 20 or 50 years ago. There are so many considerations with flight paths, noise levels, landing zones, you think one of those is going to land in your front driveway? Think again. And, at the end of the day you are still stuck in a bus with a bunch of filthy masses, not in the private comfort of your own vehicle.